There are hundreds of pet cage brands in the market today. Each of these brands comes with a variety of features to offer and accommodates pets of a unique kind (though some may be the same). Ware Manufacturing Chew Proof High Rise Pet Cage For Small Pets is a cage designed specifically to house small pets such as hedgehog pets. The wire mesh that forms the sides of the cage comes with narrow spaces to ensure that the pets do not squeeze their way out of the cage while the design allows pets to play, eat, hide and exercise. It is one of the most popular cages on the market. Ware Manufacturing Chew Proof High Rise Pet Cage For Small Pets features normal pet cages features which include feeding area, different compartments, and high rise design among others. Below is a breakdown of the features. This cage transforms a 10-gallon aquarium into a high-rise for pets. This not only saves space, but also places the pets at a focal point and an easily accessible point for the owners. The wire used to construct this cage is powder coated making it rust-resistant and thus durable. True to its name, the cage is made of chew proof wires. This means that the pets cannot chew their way out of the cage and predators cannot attack your pets. This cage has been compartmentalized to ensure that the pets find enough play area. Shelves and mesh ramps have been added on the different compartments of the cage where pets can relax and run to when the need arises. There are also exercise wheels from where pets exercise. This cage is indeed a high-rise as it features a three-floor design that creates enough room for the pets to play, exercise, feed and still have the fun of climbing. Pets can roam from one floor to the next with ease thanks to the shelves and the ramps. The roof of the cage can be removed to enable the pet owner to clean, feed pets and access the pets. The bottom of the cage is made of wire which makes it easy for the pet owner to clean as the debris can pass through. It provides enough room for your hedgehog pets. Can fold for easy storage when not in use. The cage is chew proof and thus durable and can be customized for your pets. The wire holding the water bottle is weak, and thus the bottle keeps getting loose. The exercise wheel makes some noise which may not augur well with most people, especially if the cage is near the living space. Ware Manufacturing Chew Proof High Rise Pet Cage For Small Pets comes with a well-ventilated design that allows pets enjoy the fresh air. The cage measures 11 inches by 19.5 inches by 10.5 inches and weighs about 4.1 pounds. The cage comes with a feeder and a water bottle. Each of these is well fixed to ensure that pets do not tip them over and spill their contents. This cage comes ready to assemble; can be assembled in minutes without the need for any tool. Better yet, it can be dismantled easily and is foldable to ease storage. The cage is available on Amazon and hundreds of other online stores. 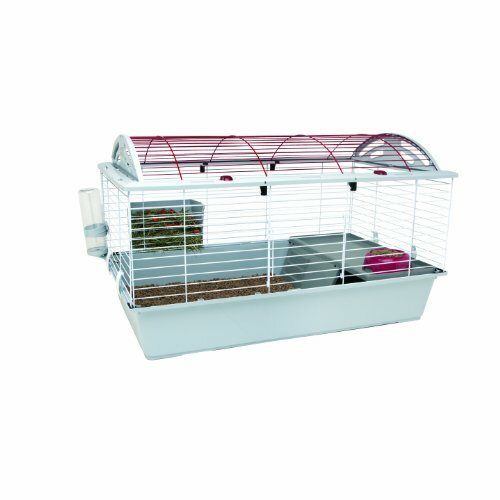 If you want a good quality cage at competitive prices for your mice or gerbils, Ware Manufacturing Chew Proof High Rise Pet Cage For Small Pets is the most ideal out there. The cage has been designed with the needs of the pet and those of the pet owner in mind. The cage measures 11 inches by 19.5 inches by 10.5 inches and weighs about 4.1 pounds. There are hundreds of pet cage brands in the market today. Each of these brands comes with a variety of features to offer and accommodates pets of a unique kind (though some may be the same).